Tuesday March 18th 1884 It is still cloudy I was busy about the work all the forenoon and went to town in the afternoon. I was at Hatts awhile and stopped to do a little trading on the way home. Wednesday March 19th 1884 More rain today. I was busy about the work most of the forenoon but fixed May a gossamer out of old one of Hatts. In the afternoon I made the pair of pillow cases for Hatt. I was home all the evening. Thursday March 20th 1884 I washed this forenoon and went over to Hatts some after dinner and she and I made her carpet for the front parlor. Ott came after supper and we all went to the opera house to hear 'Fay Templeton' in "La Belle Coquette" and enjoyed it very much and had a letter from Will Reed. 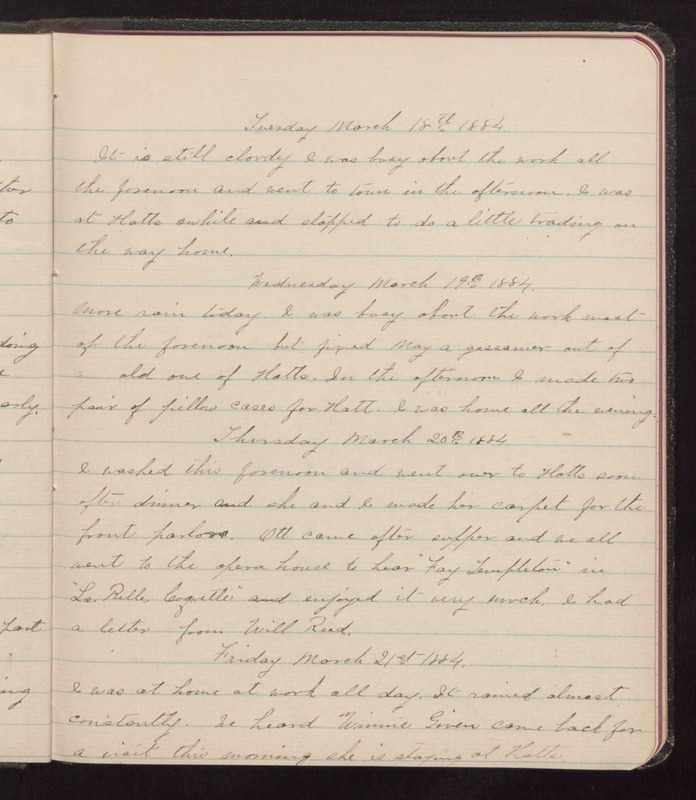 Friday March 21st 1884 I was at home at work all day. It rained almost constantly. We heard Winnie Given came back for a visit this morning she is staying at Hatts.